I started quilting my Christmas tree skirt today. Tomorrow is crazy busy but I might be able to work on it some more. I also hand-prewashed the fabric for the binding. Easier than dealing with all the fray damage from washing it in the machine and I can see how much it bleeds too. Other current projects include a spectacularly ugly set of jammies for my 2 yo and 4 pairs of boxer briefs for my boys. Pics later; I keep saying that, I know. It is a rib knit with deep orange, lime, and slate blue diamond print. I matched it with orange sleeves on the jammies and variations of orange and slate blue for the undies. I also need to make up winter hats for gifts for the rest of my nieces and nephews, and maybe a custom order, and a stocking for my younger son. For his 3rd Christmas. Well I got out the insane quilt project the other day and did a bit of work on it. I want to finish it and put it up on one of my big walls in my living room. I am also sewing church pants for my older son, undershirts for my younger, and a long sleeve tee for me. Wrap dress that I'm kind of interested in making. We went on vacation and came back and I don't know what I want to sew now. I have a patchwork quilted bag in mind. I really do NOT like those fashionable quilty bags but this one is different, hehe. Maybe tomorrow I will look in my bin and see if I have something that would go well for that project. I also have some nice fabric that would make good long sleeve tops for fall for the boys but that will involve tracing a new pattern for my growing older one. And I have a neighbor kid birthday coming up; M will be 1 on Sunday and I kinda want to make her something. Here are the NYB blocks I made a couple weeks ago. I finished one pink baby outfit today and will work on the other set tomorrow, I hope. It was fun and easy to do on the serger; I have made this pattern several times for my ds2 before I got my serger and it makes a huge difference=less time with the serger. I did velour for the neckline and it's kind of wavy but I think will be ok.
For HB I am still contemplating making her several snap trainers too but need to buy some stuff for them. I want to stop by the OP quilt shop to see what they have as far as summer Hawaiian print fabric and get my scissors sharpened. I'm on the fence about making a summer surf ebay set; is it too late in the season or not? I have a plan for a really cool camo set and want to get started finding the fabric for the pants, that is if I'm not going to go ahead with the surf outfit. I am also trying to brainstorm a new ebay ID; I kind of really don't like the one I have now, it doesn't reflect what I want it to. I will put up a picture of some of the pink stuff after I get it taken in the next day or 2. It turned out quite cute. Well my sewing for fun turned into making another set to list on ebay. This time I will only recreate it once and we'll see how it goes. I also cut out a bunch of Pink! baby stuff for a couple of my friends and hope to have fun making up girly outfits soon. And, I'm on the lookout for some kind of fabric that will be cool for a peasant top for me. I am almost all done with my 2 customs for ebay and I'm wiped out. Tired of the work and time it takes. So for a while I will work on sewing for fun. 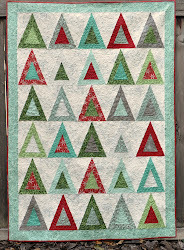 Maybe I'll make one of the frayed edge flower quilt blocks that I really like from the new Quilt Sampler magazine. I need to ship the ebay sets like Monday if possible. I have another idea for a cute summery ebay set but just can't go there right now. I'll think about fall for a while. I do want to get out my New Conceptions pattern and make an outfit for Annie and see how that makes me feel. I really think I just need a vacation. Still thinking about starting yet another blog. Yup. Maybe I will put all my links in it of the blogs I like to read regularly. I kind of want to soo... I will. I quilted my mom's memory quilt yesterday and the day before. I did free motion quilting. I have these nifty quilting gloves with rubber dots on the palms and fingers but guess what, if your quilt has shiny fabric on the bottom the gloves don't help. It was like the shiny fabric (from my grandma's wedding dress) was sticking to the metal plate under the presser foot. I had to take the gloves off and actually grip the fabric with my hands. It was quite tiring and made me stiff too. My mom made the quilt top and I'm just helping her finish it. Her mother, my grandma, died a year and a half ago? Yes I think that's right. The quilt top is made of some hankies and clothing items of my Grandma's. Mom has glued on some trinkets and jewelry items to the quilt top and she's going to sew buttons from the wedding dress on the quilt after it's all done. And also she will be appliqueing 9 photo transfers of my grandma to the quilt top after it's done. Left for me to help her with is the binding, making a pocket on the back so she can write about each photo and about the quilt and then store that with the quilt, and a hanging sleeve on the back of the quilt. Busy! I sold 2 custom outfits from my last ebay auction and possibly a couple of hats too. I have shirts and shorts cut out and need to get going on them but have been busy with my out of town company. I am thinking about making snap trainers for my friend H who is ECing her new baby. I also need to make a few more for J who is outgrowing his blue and white ones. I need to figure out the cost on all of the materials and get my order in on that. Take pics and post them here! Decide if I'm making a baby outfit for Emily from church. Decide on what to make for Heather B's new baby (probably poquito pants, maybe a quilt). Decide what to make for me out of my Target score (2 table cloths, about 2.5 yds each, $4.98 each). Make my light blue skirt. Work on my pattern and make a t-shirt or 2 for me. Other baby gifts upcoming: Annie and sensei. Well I'm investigating and dabbling a bit in eBay boutique sewing and a lot of the froofiness isn't my bag. Even on boys' clothes. I'm going to keep doing it some and see how it goes. I'm also thinking about setting up a store on etsy. It's a bummer that the sewingmamas shoppes aren't doing all that well. Of course we could advertise them a bit more I suppose. I have 2 eBay sets I need to finish up this week and then I'm going to make a little 4th of July tote bag for another launch I'm guest designing for. I also cut out July 4th camp shirts for my boys and might post that on eBay too as a custom but I have to decide if I'll make a hat or something to go with it. For now I'm not up to making it into a whole set. I have a summery skirt for myself cut out and I need to make short sleeve tees for myself too. I've been working on my ebay auctions a bit today; it will be a first for me. I want to learn html. I have a fun idea for kids' t-shirts. My youngest is naked so that will be the end of this post. I've been thinking of starting a new catchall blog to write about my whole life but still haven't come up with the perfect name. So for now I'm doing a sewing blog and we'll see how that goes. Of course I can write about whatever I want but I always seem to need to write about my sewing. 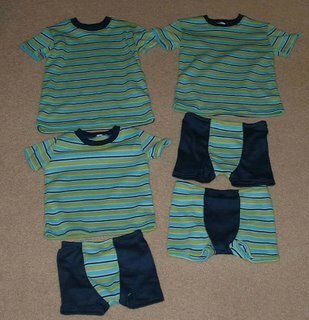 So, here is one of my latest projects--shirts and unders for my boys. One of the shirts is an extra and is for sale at my little shoppe at Sewing Mamas Shoppes. How's that for a little spam. Current projects I'm working on include more stripey shirts and unders for the boys, and a pair of shorts for my newest endeavor, sewing for eBay. I'll have my first auctions up in just a few days. I'm nervous about it but I just need to go for it. I made a bedskirt yesterday. It isn't perfect but it's a much better look than my turquoise box springs hanging all out. I also have 3 pair of shorts for my older son cut out and birthday sewing for him in the works that includes an apron, chef hat, and football-themed pj shorts for him and his best friend.